Last week I finally got to check The Roof off my Utah bucket list! I've been wanting to eat here since I joined the church. 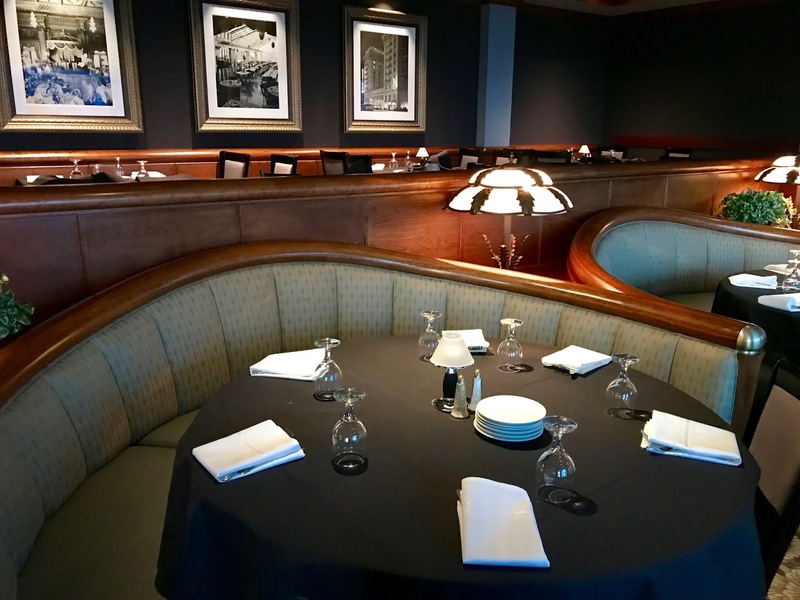 Since it's known as one of the more romantic restaurants in Utah, I'd seen tons of friends celebrate anniversaries or get engaged at one of these tables. I'd been to the top of the Joseph Smith building tons of times, but never behind the doors of The Roof! We were seated at a table right next to the floor-to-ceiling windows, with a perfect view of the Salt Lake Temple. 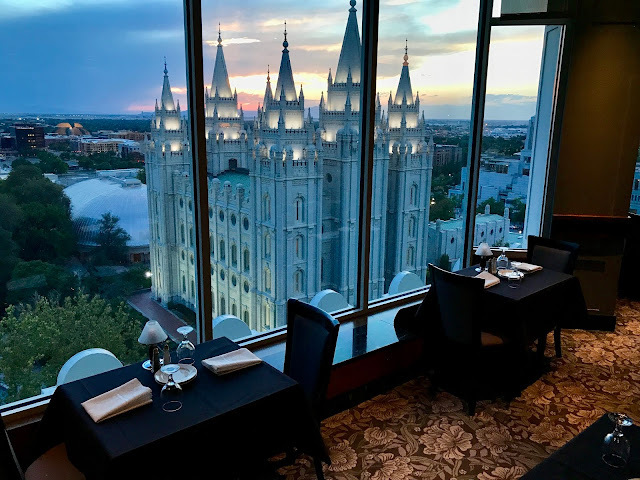 Even if you aren't seated right by the window, the restaurant is set up in levels, so everyone has an incredible view, no matter where you sit. 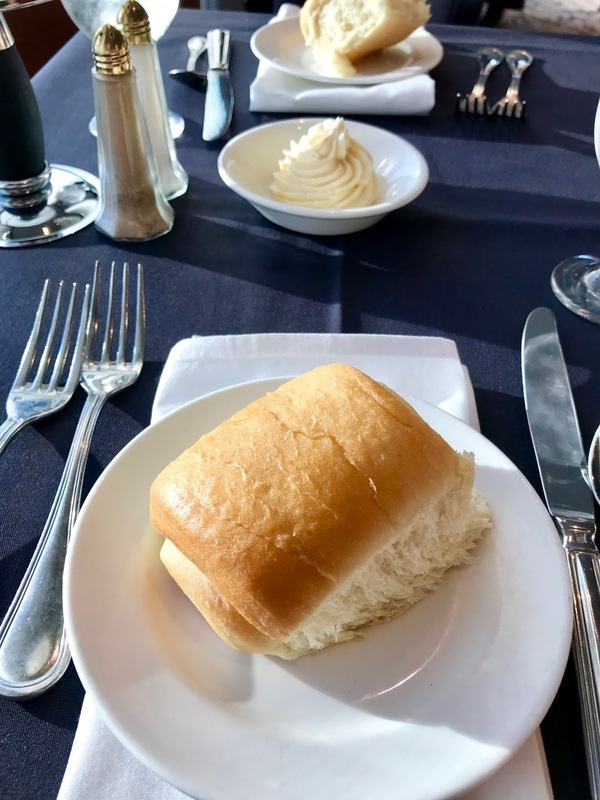 Soon after we were seated and ordered our drinks, they brought us the famous Lion House rolls and sweet butter! 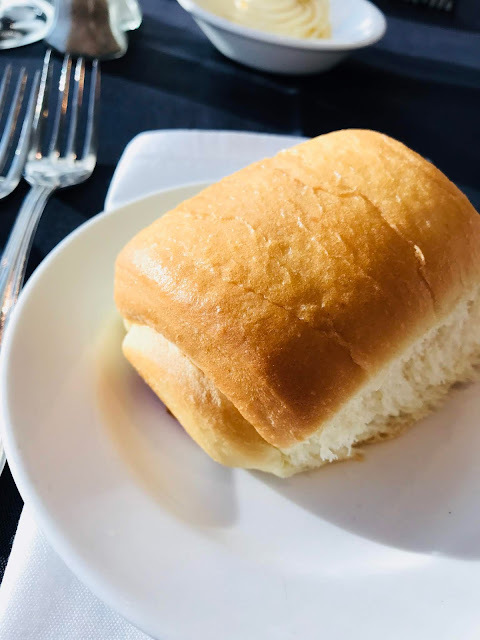 I have a freaking testimony of these rolls and butter you guys. If you've never had one of these rolls, you need to run to Temple Square immediately. I posted about our dinner on Instagram Stories and I literally got a hundred DMs about these rolls! Everyone loves them. 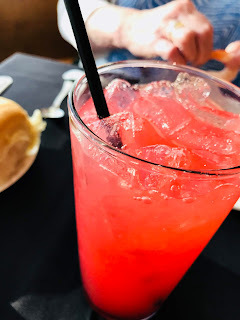 Zach ordered a blackberry lemonade and my mom ordered a raspberry lemonade - both were not overly sugary or sickly sweet, which we all loved! Zach said it was one of the best blackberry lemonades he's ever had. The Roof has so many different food options - I love that it's a buffet because I'm indecisive and want to try small amounts of everything! 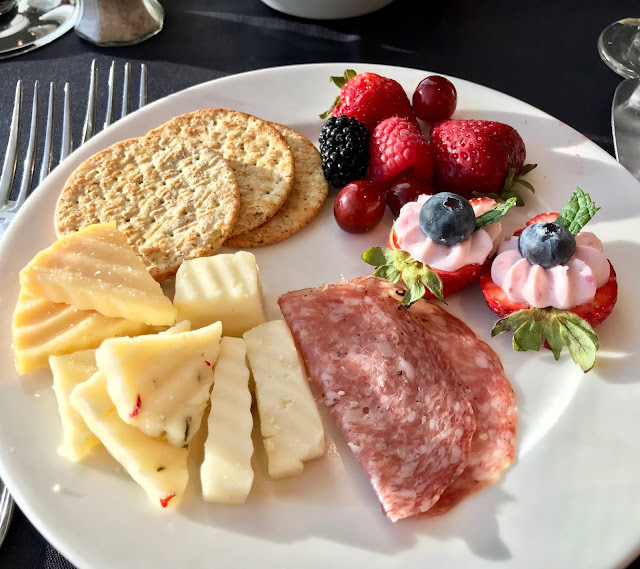 I started with just a simple cheese, fruit and cracker plate. 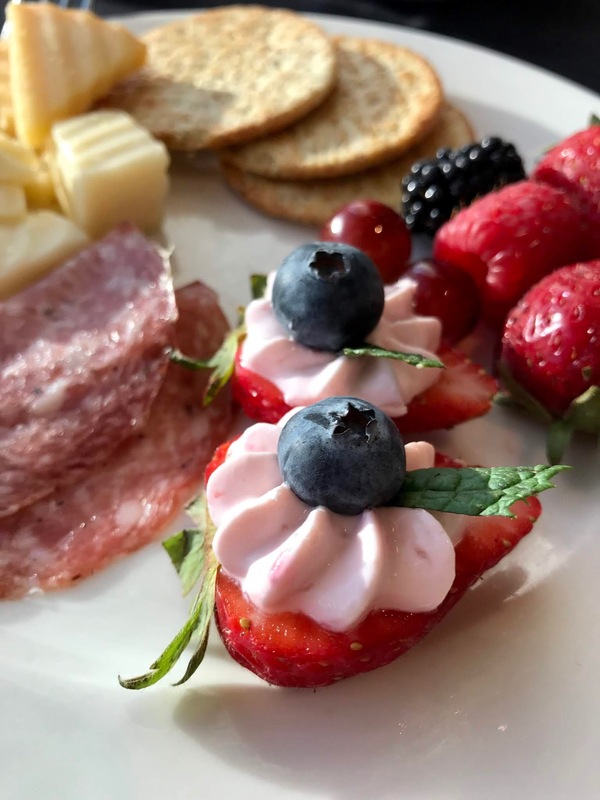 I loved that they had a huge variety of cheese to choose from, the fruit was really fresh and sweet...and my favorite part of this plate were the stuffed strawberries, topped with a blueberry and mint! I could eat these nonstop for the rest of my life. I didn't grab any soup for myself, but Zach tried the clam chowder and my mom tried the french onion soup. The clam chowder has cheese in it, which was a great change from normal clam chowder. For main courses, it was so hard to decide! The Roof has so many options! I was already starting to feel full, so I had to choose wisely! I tried the prime rib and got a little bit of the sides: fingerling potatoes, roasted veggies, and bowtie pasta with sun-dried tomatoes. I loved everything about this plate! 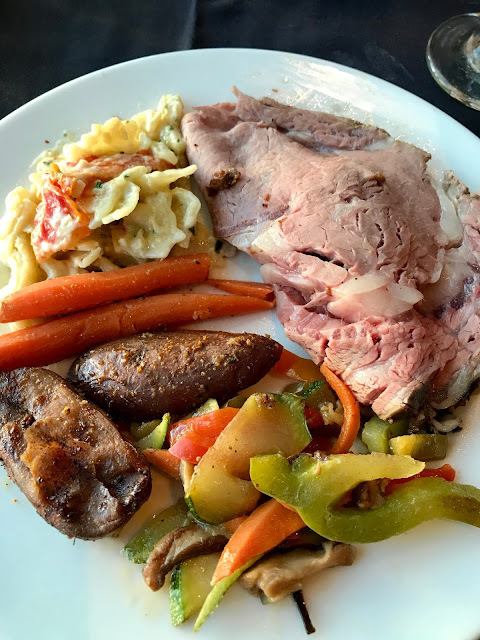 The prime rib was super tender and buttery, the vegetables & potatoes were well seasoned....but the pasta was incredible! I actually usually don't like pasta, but I could've eaten bowls and bowls of this stuff! Zach loves pasta and this dish was no exception! 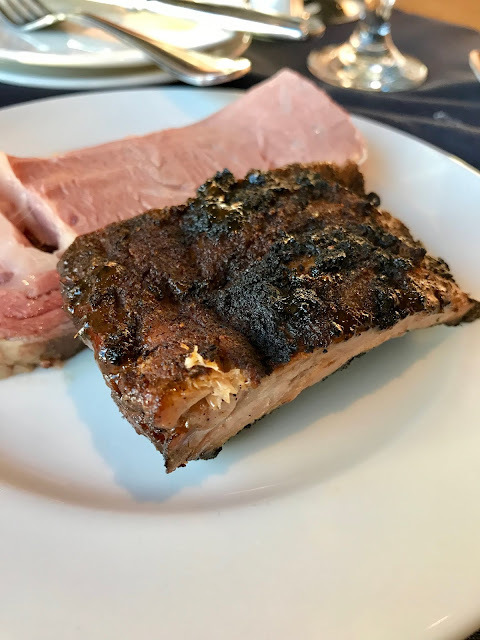 Zach & my mom also tried the ribs, which ended up being my mom's favorite meat selection. Zach also tried the mashed potatoes, which he said were the best he's ever had - in fact, I didn't get to snap a picture of them because he ate them so fast! While the prime rib was great, my absolute favorite meat selection was the day's special, a citrus chicken with honey mustard sauce. The chicken was juicy, with a nice char on the outside. The sauce was flavorful without being overpowering and I liked the shredded zucchini and carrots on top! I want to figure out how to make chicken like that! 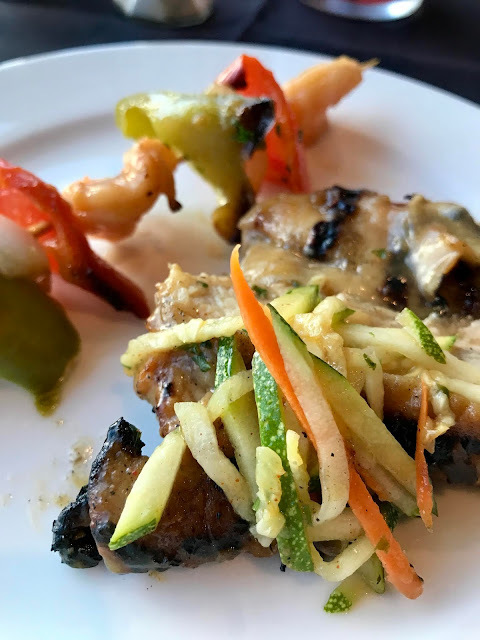 In the back of this picture is a shrimp kabob with pineapple teriyaki glaze - they also have rice to go with it, but I personally don't really like white rice. 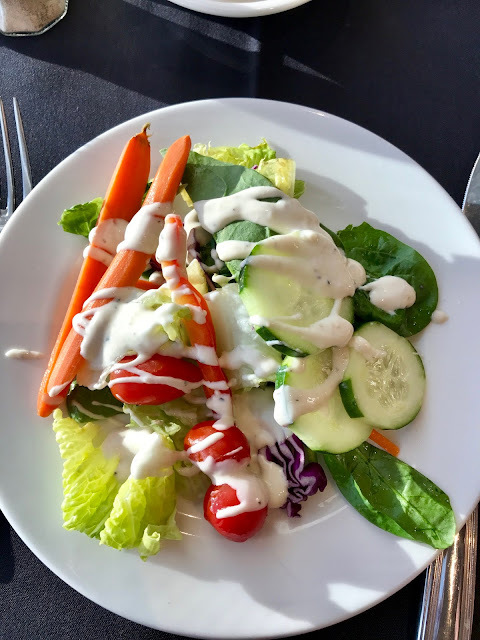 I loved these kabobs as well and that it added to the variety of food - instead of only traditional American meat and potatoes/vegetables, there were many entrees options to choose from! 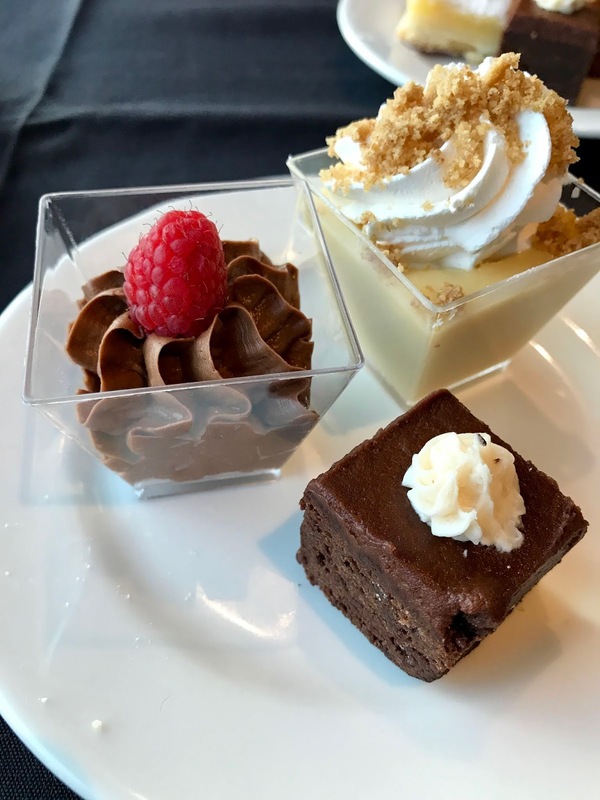 Although I could've completely stuffed myself with salad, rolls, seafood, cheese, fruit, entrees, etc....I had to plan to leave enough room to try all the desserts! Of my friends who have dined here, everyone raves about the desserts! 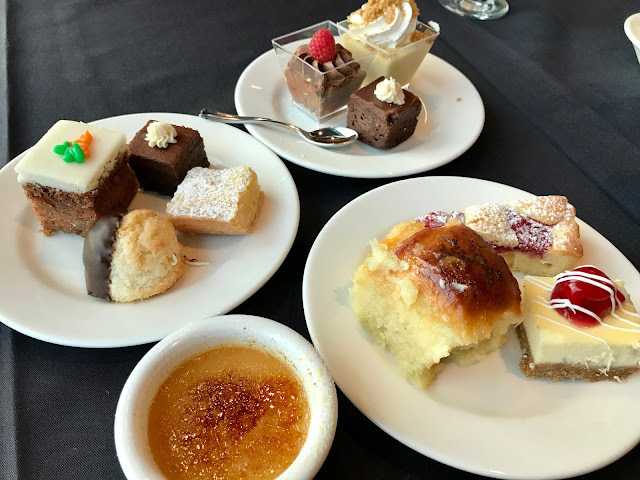 If you Google The Roof, you'll see countless reviews about the extensive dessert buffet. The desserts are always different, so now I want to go back and try everything else! 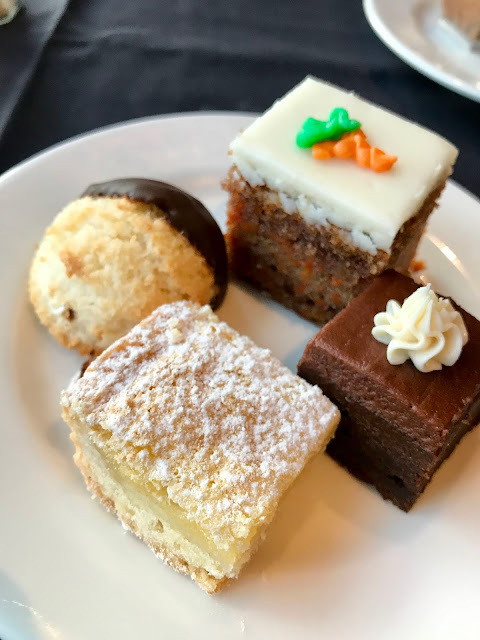 I loved the tiny portions of all the desserts, so I could try a little of everything they served that night. We grabbed a few plates of everything and split them between the three of us. 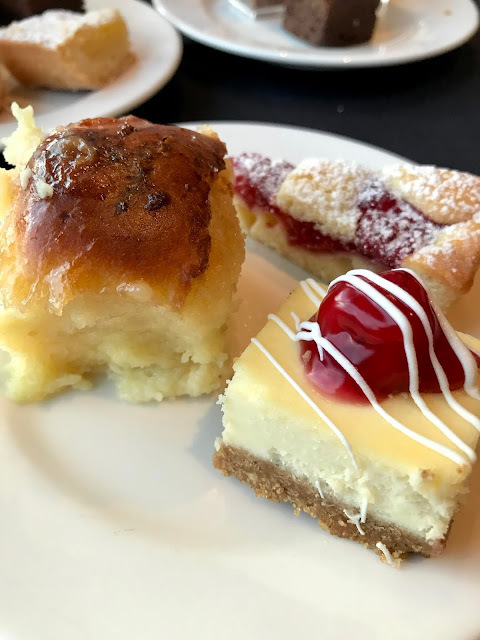 - the bread pudding: all of the staff made a special point to mention the bread pudding. And for good reason! It's actually made with those incredible Lion House rolls. - the brownies: probably my #1 favorite dessert there and one of Zach's top picks! Super dense, moist, and chocolatey. - macaroons: I'm a sucker for coconut and these macaroons were incredibly moist, sweet, and being dipped in chocolate took it over the top. - chocolate mousse: this was my mom's #1 favorite dessert. It's very creamy with a raspberry on top and comes with a tiny cute spoon! Everyone on staff at The Roof was so kind. We were asked often if we needed anything, how the food was, etc. We definitely did not feel forgotten about! I especially loved the live piano music during dinner! The piano sits right next to the buffet, so the music can be heard everywhere. 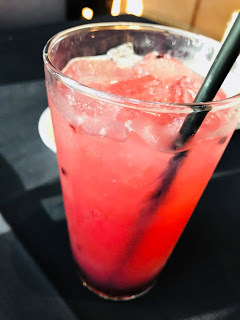 The view was one of the biggest reasons I've always wanted to dine at The Roof! I planned our reservation around sunset and the timing was perfect! It was bright when we started our meal, but by dessert we had an incredible view of the sunset behind the temple. I totally see why people choose this setting for celebrating special occasions. Once sunset began, everyone around the restaurant jumped up to snap a picture! I didn't have to go anywhere special - this was the view right from my chair! We had such a lovely evening at The Roof! It was perfect timing to bring my mom while she was visiting us. We all left satisfied and full - I felt pregnant with Lion House rolls! No complaints here! Zach and I are planning to come back again (maybe for our upcoming anniversary Zach? Hint hint...). 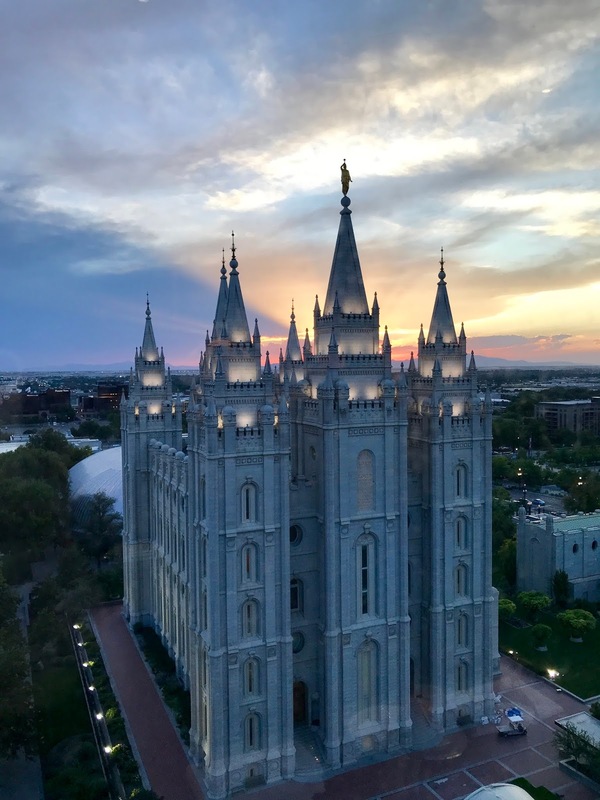 Thank you so much to the Temple Square team and The Roof for inviting us to dinner! We loved it! If you want to make reservations, learn more about Temple Square dining, or check out what's new on the menu, click here. It is more intelligent to opt for a more experienced and qualified contractor, because the higher the rates the better the quality of construction they offer. In my opinion, mauiroofingcontractor.com is the best roofer I have ever seen.